2'6" high, 1' 7'' wide, 2" thick. 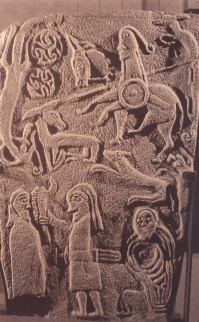 A single panel, upper left: a reptile; right, a double disc symbol; a man on horseback with shield, spear and sword; beast with feet curling underneath; a hound; another animal with feet curled beneath it; a beast with curling tail; and a reptile like that on the other edge of the slab; at bottom is an unarmed figure with another figure with long hair (Susanna and the Philistine); right hand corner of the slab a prostrate figure, legs doubled up. Stuart, J., The Sculptured Stones of Scotland 1st, Spalding Club, Aberdeen and Edinburgh (1856-1867) Plate 68, Volume 1Stone, Sculpture, Scotland, History, Archaeology.